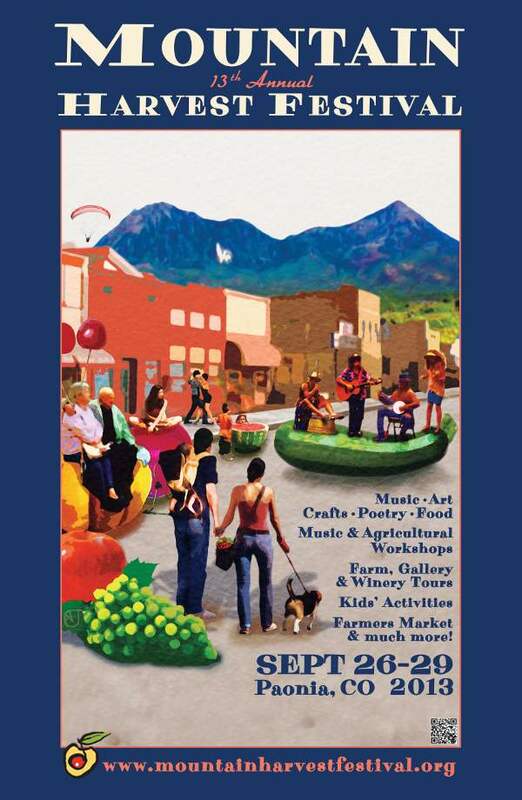 That’s a bit of an understatement–as the festival has grown and evolved into a wide range of activities for all ages and interests, from art shows and gallery walks, poetry and spoken word, grape-stomping and winery tours, music–all over town, all weekend–to a pub crawl and farmers’ market. It is a celebration of the North Fork’s lifestyle, and an opportunity to share the bounty of our valley this time of year. 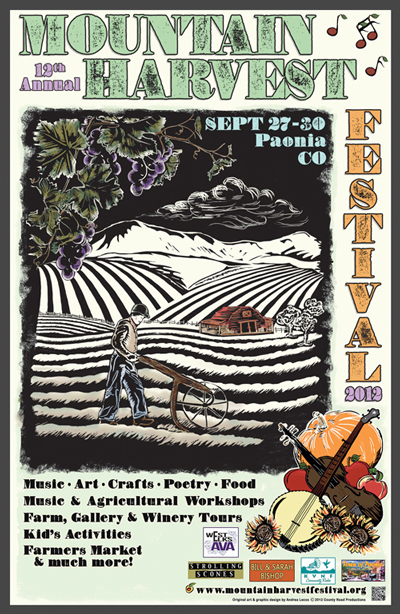 The idea behind the Mountain Harvest Festival was always to combine the elements of the North Fork’s agricultural heritage with its abundant wealth of creativity–art and music–and to highlight how these elements work together to create this amazing community. 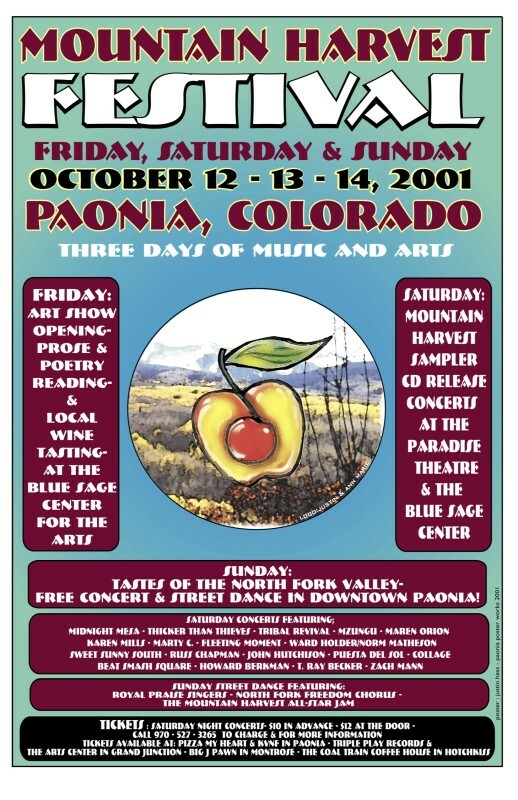 That convergence of elements is on display all weekend, and in the posters that advertise the festival each year. 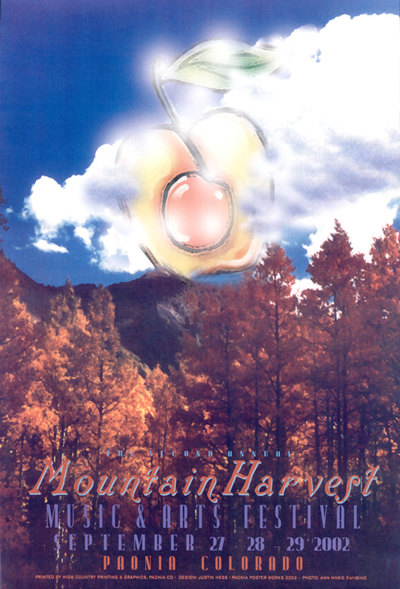 The first Harvest Festival, in 2001, debuted the logo: a cherry ‘musical note’ inside an apple. That year–and for the several that followed–the Festival took over two blocks of Grand Avenue. Shops set up tables on the sidewalk, bands played downtown, and the town turned out for a chili cook-off. 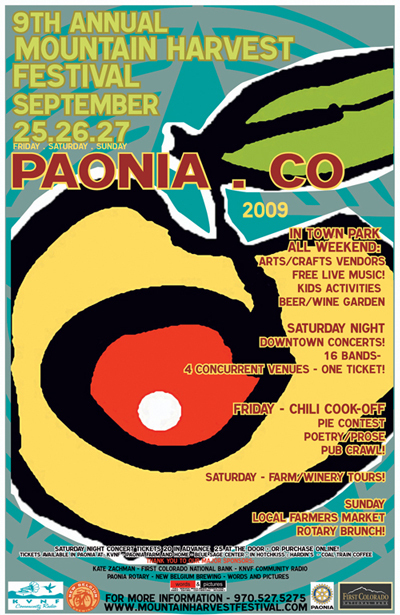 Local musician and graphic artist Justin Hess designed the first poster (and the several following) and created the logo, still in use today. In 2002, although the logo is present, the dominant feature is an original photo by Ann Marie Gambino, conveying some of the natural beauty of the place and evoking the changing colors of the season–a major draw to the region known for its outstanding autumn displays. Justin Hess, who did the layout, describes the feeling it conveys as a ‘good vibe’ and its understated nature, less busy than the year before, conveys the serenity of a late September day. 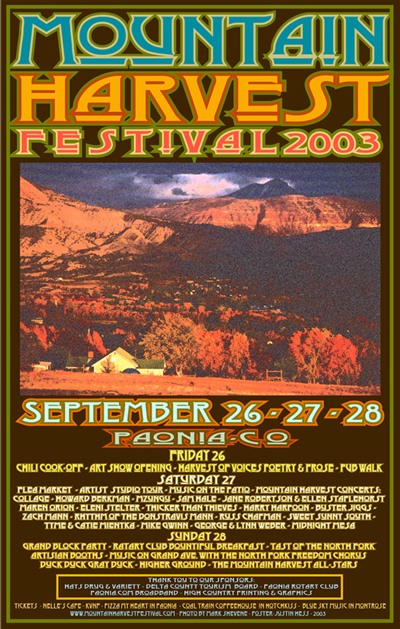 2003 carried forward the idea of a dominant photo (this one by Mark Shevene), but brought back key information–musical performances, major activities, and the like. It also listed event sponsors, more fully engaging the North Fork’s business community. The logo disappeared in 2003, and did not reappear fully until 2009. 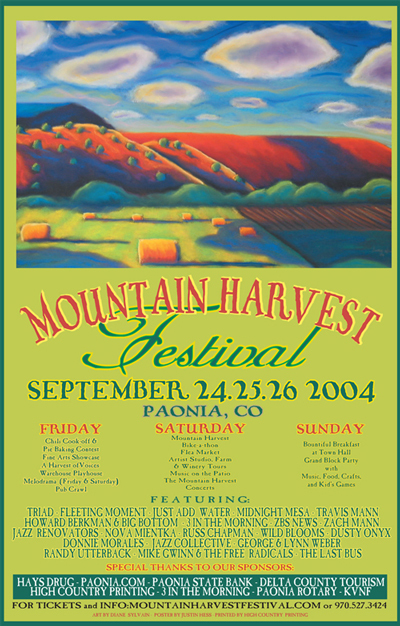 The 2004 poster included original artwork by Diane Sylvain that is an ‘easy on the eyes’ rendering of the last hay harvest with puffy clouds in a Colorado blue sky. 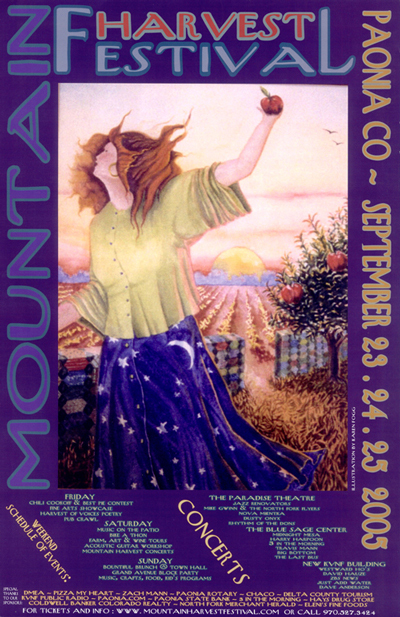 2005 included more original artwork, by Karen Fogg, that reintroduces music (dance), fall colors, and the harvest–a cut hayfield and an apple tree. 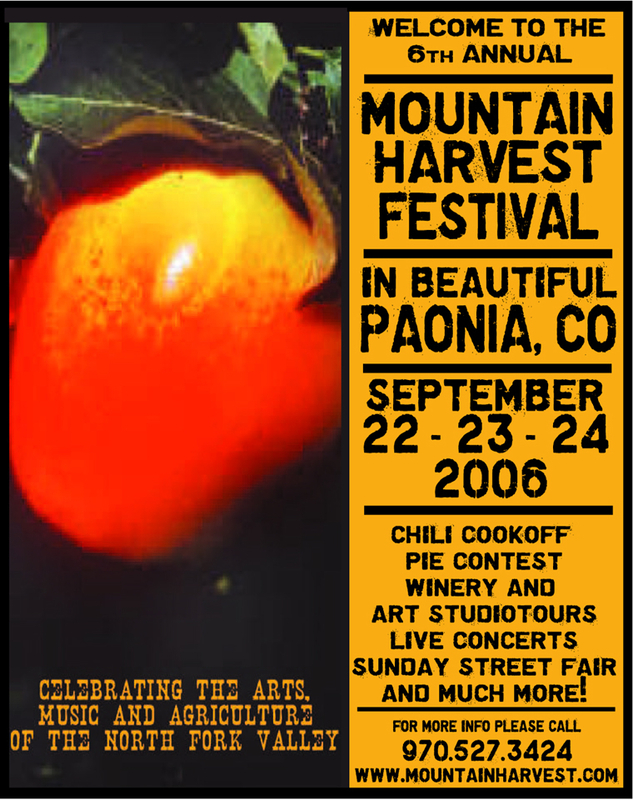 In 2008 the Mountain Harvest Festival outgrew its Grand Avenue roots and Moved to Town Park. This poster went in a new direction, with a less realistic design, and began to bring back the logo. 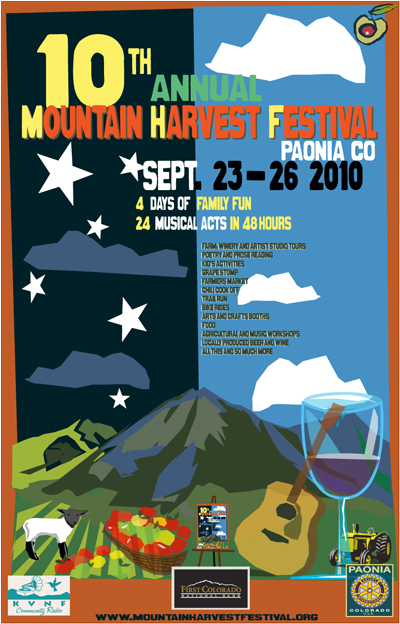 In 2009, the Mountain Harvest Festival logo was again on full display–making up the central part of the poster design. It also included, for the first time, sponsors’ logos rather than just their names. In 2011 and 2012 the original artwork was provided by visual artist Andrea Lecos, in an Americana style. 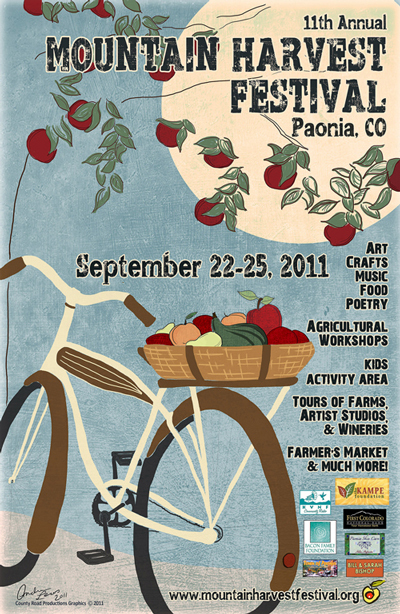 2011 included the harvest moon, along with a ‘towny’ bike and harvest basket. 2012 is evocative of early seed catalogs, and reintroduces the centrality of music to the festival with the grouping of instruments (and harvest produce) in the lower corner and ‘cherry’ notes in the upper. This year, 2013, included the first poster contest, with over 30 entries from contestants ranging in age from 14-60. The winning selection, which combines photos into a fun collage, was submitted by Aaron Jerad. Many of the posters from the contest–including some submitted by students at the North Fork Montessori School and the Paonia High School and Junior High School will be on display all weekend at the Glennie-Coombe Gallery on Grand Avenue. 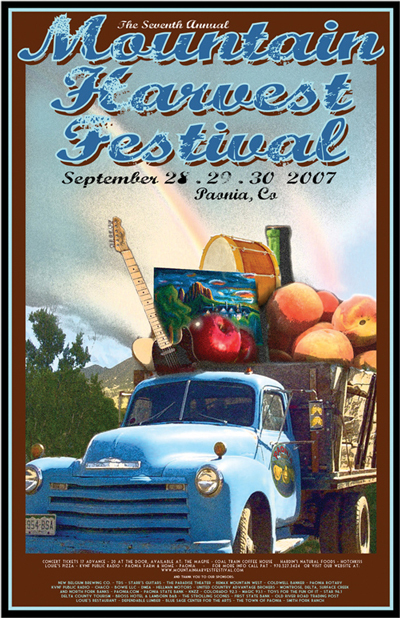 All the posters from the festivals past will be on display, as banners, in Town Park. Come see them and get inspired!